Are you looking for Best Cat litter Tray? Cat Litter trays are an essential equipment for anyone who has an indoors only cat or who are away from home for hours at a time and don’t have a cat flap. No-one wants to return home to a pet accident in the middle of the floor. The litter tray market is, for want of a better word, littered, with options. Some open, some enclosed. Some with scoop free, odor eliminating or even self-cleaning technology. Whether you need an all day everyday option, an occasional backup for if you are out of the home or emergency cover for whilst traveling with your cat there is sure to be an option out there for you. Each has their own specific uses and benefits depending on your needs. 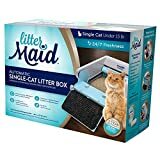 An automatic self cleaning litter box is perfect for people who are looking for minimal fuss or are unable or unwilling to regularly clean their litter boxes. Also great for anyone absent for more than a few days these automatic cleaning boxes often have self contained waste storage to limit mess and odor. LitterWorks® Permanent Scoopfree® Compatible Litter Tray. Heavy duty, "seamless" plastic design replaces disposable tray refills, pays for itself in a few months. An excellent option for anyone who is going to be away for prolonged periods or who don’t have the time to be emptying litter trays regularly. Also great for elderly or disabled cat owners who find it difficult to regularly empty litter trays. Self cleans for weeks with no refilling. Rakes waste into an enclosed compartment to stop odors. 3 setting options for automatic clean timers. Privacy hood creates enclosed environment for cat and prevents litter scatter. 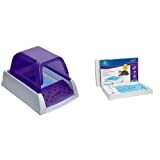 Designed for single cat households with cats under 15lbs this mechanized litter tray offers self cleaning. Its waste receptacles make emptying easy and convenient and it even offers an access ramp for less athletic cats making it great for older pets. Most self cleaning boxes come with disposable trays and often cleaning parts. Some pet owners may be looking for a more permanent replacement and in response many of the self cleaning box makers offer their own replacement options. Rather than a litter tray in its self this offering is designed to replace the disposable litter trays in the PetSafe ScoopFree original and Ultra Self-Cleaning ranges. PetSafe state that using alternative products may void the warranty items in their range so it you want to keep warranty coverage this is the item for you. Comes with a pre portioned pack of premium crystal litter. Stainless steel magnets on the waste shield wont rust and help secure the waste trap to keep odors in. Another replacement tray for another product rather than a litter tray in its own right. Designed to replace the cardboard disposable trays in Litterworks’ Scoofree and Soopmaid products. Includes nose guard to help reduce odors. 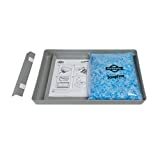 This is a litter refill pack from PetSafe for their tray offerings. Coming in a 3 pack this crystal litter is designed to be easily loaded coming in its own leak proof tray meaning no more scooping or touching waste. Each tray is useable for up to 30 days. Uses 5-10 times less than traditional clay or clumping litter. Low tracking and 99% dust free. Again a replacement tray for an automatic cleaner, this time from Forever Litter for their ScoopFree litter boxes. Again a more robust replacement for the original cardboard disposable trays. No metal parts to avoid rusting. One piece construction made from anti microbial plastic. Sifting trays are an alternative to self cleaning trays, designed to give a simple lift, shake, go system they make manual cleaning quicker and easier than using scoops. This design comes with 2 each of the base and sifting tray. The sifting trays catch waste and soiled litter whilst allowing clean litter to remain in the tray meaning litter waste if drastically reduced. Its quick lift, shake, empty and replace system really is about as easy as a reusable tray gets. Lift N Sift tray system cleans litter in seconds. Works with traditional clay, clumping and silica gels. This clever design combines sifting tray to remove worst of waste for a quick clean along with secured hygiene bags for more thorough cleaning. This large and robust product should be more than sufficient for even larger cats. Removable frame and side locks for hygiene bags. 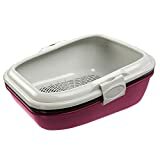 A disposable pet litter box offers a great short term option for cat owners, either for temporary use or use when travelling. Their use and throw approach make these the lowest maintenance option in the market due to the removal of any cleaning. 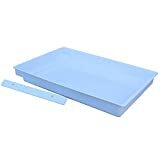 This 50 pack of disposable trays is great for people who want no fuss, simply bin when used and the next one in the stack is ready to go, simply fill with litter and you’re on your way. Its even made from recycled plastic for those who are environmentally conscious. Perfect for travel where your pet goes too. These disposable trays are light to carry and even come with free cats Pride litter. Lightweight for convenience and portability. Made from recycled soda bottles. With a wide range of options on the market cat owners can genuinely take their choices depending on their needs. Many may combine either a sifting of self cleaning style box at home with a more disposable option for travel. Price is of course a key factor and particular attention should be paid to the cost of accessories such as refills, particularly where taking a non brand refill voids any warranty.